When I first heard that Gandhi was viewed as “the enemy” by many Dalits in India (formerly called “untouchables”), I was dumbfounded. How and why could Gandhi be seen as having betrayed the Dalits when he opposed untouchability even in the face of active discomfort on the part of close associates? Last month, while I was in India teaching Nonviolent Communication to 120 people, including a significant number of Dalits, I had the opportunity to explore this question further. During a session called “Gandhian Principles for Everyday Living,” a topic about which I have written at length, one of the 60 people present expressed anguish, pain and anger towards Gandhi. He was a Buddhist, like many other Dalits who had chosen to follow the Dalit leader Dr. B. R. Ambedkar in leaving behind centuries of mistreatment under Hinduism. I dedicated much of the two-hour session to hearing and understanding his experience. I learned more about the power of deep empathic reflection than about the issue itself. With the presence and active attention of an entire group, he experienced a profound shift in his perception. In the end he said: “Perhaps it’s personal pain from my childhood and all the experiences I had that I just attached to Gandhi.” He didn’t actually know the details of what Gandhi was held accountable for. Nor did I. After the training ended, I went on a personal pilgrimage to Gujarat, Gandhi’s home state and the birthplace of the Salt March. I met with the editor of a Gandhian journal in Gujarati, who told me that he believed Dr. Ambedkar saw things more accurately than Gandhi, and that his followers have something to teach the Gandhians. Slowly, the details emerged. 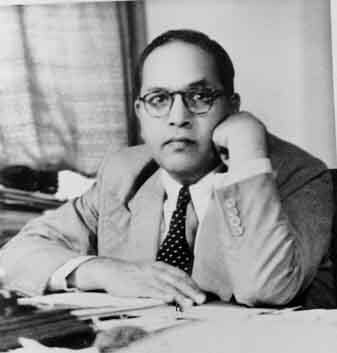 The bitter dispute originated in the 1930s, when Gandhi mounted a “fast-unto-death” in response to a British proposal, based on Ambedkar’s recommendations, to award the “depressed classes” (the Dalits) a separate electorate in the Indian parliament. Frantic negotiations under pressure of saving Gandhi’s life resulted in the Poona Pact which substituted a guaranteed number of seats in the parliament for the separate electorate. Although the pact was signed by Ambedkar, his followers, and many of Gandhi’s followers, the complex provisions elaborated in it appeared to many to deny the Dalits any real access to power. Despite what Ambedkar said at the time to Gandhi and others, he later said he signed under immense pressure and claimed that Gandhi was actually against equality for the Dalits. 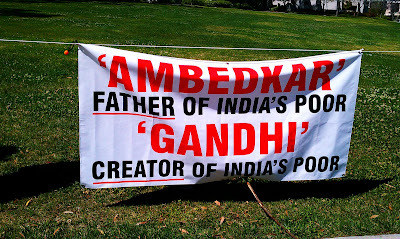 Ambedkar suggested in a 1955 interview that Gandhi didn’t truly “deserve” the title of Mahatma (great soul). And yet, a close look at Gandhi’s own words leads me to conclude that his position was based on a deep commitment to fully eradicating untouchability from Hinduism. I have no difficulty understanding and even sympathizing with Gandhi’s reasoning. Gandhi didn’t see political solutions per se as fundamental and lasting. He sought, instead, moral and spiritual paths. He called on Hindus to atone for and redeem the sin of untouchability. He was concerned that being politically separated from the issue would leave Hindus without the motivation to create the necessary change of heart. He believed that his willingness to die would awaken Hindus to the poison of untouchability. Indeed, following his great fast, scores of communities removed barriers to “untouchables” attending temples and drinking water and eating with others. Nonetheless, I see Gandhi as having made a serious mistake in pressing the point, and am not surprised that his strong opposition to granting rights to a despised minority has been seen as lack of interest in their equality and empowerment. Knowing people’s dedication to him, Gandhi used the moral force of his person to call on people to live up to a vision that was not yet possible. In other instances, he accepted purely political and less-than-ideal solutions to work with practical realities. This is what Ambedkar was proposing, and what the Civil Rights movement in the US was able to press for: despite a lack of true change of heart, legal-political solutions can make a tangible difference in the lived experience of disadvantaged groups. The vision of a united Hindu society was so dear to Gandhi that he wasn’t willing to accept a partial solution. This error is one of the reasons why Gandhi ultimately failed. The moral force of a person is not sustainable. The partial gains made at the time of his fast were short lived. I struggle with similar dilemmas today, albeit with far smaller ramifications. Hardly anything possible in the present would ever align sufficiently with my large vision for me to support it. I nonetheless know that to remain relevant and respected I need to balance vision with practical reality. No easy answers, ever. Working for a true change of heart may well be an unaffordable luxury when urgent action is required, such as when global planetary resources as well as social, political, and economic institutions are collapsing. And yet, no matter the urgency, if we want to create sustainable long-term change and establish relationships, structures, and systems that serve all life, we need to augment political and structural arrangements with ongoing efforts to transform how we approach social change work. Gandhi’s fundamental lessons still stand. There is no substitute for an inclusive vision and actions based on love.